At More Space Place, we pride ourselves on creative storage solutions. For this reason, our storage systems are not merely functional – they can be elaborate displays of their own, characterizing their corner of the room with shape, size, color, and more! Murphy beds in particular tend to add flavor to home decor, but which is best for you? The color of a murphy bed may be the most influential factor in its production of ambience. So the question is, what vibe do you want to give with your murphy bed? 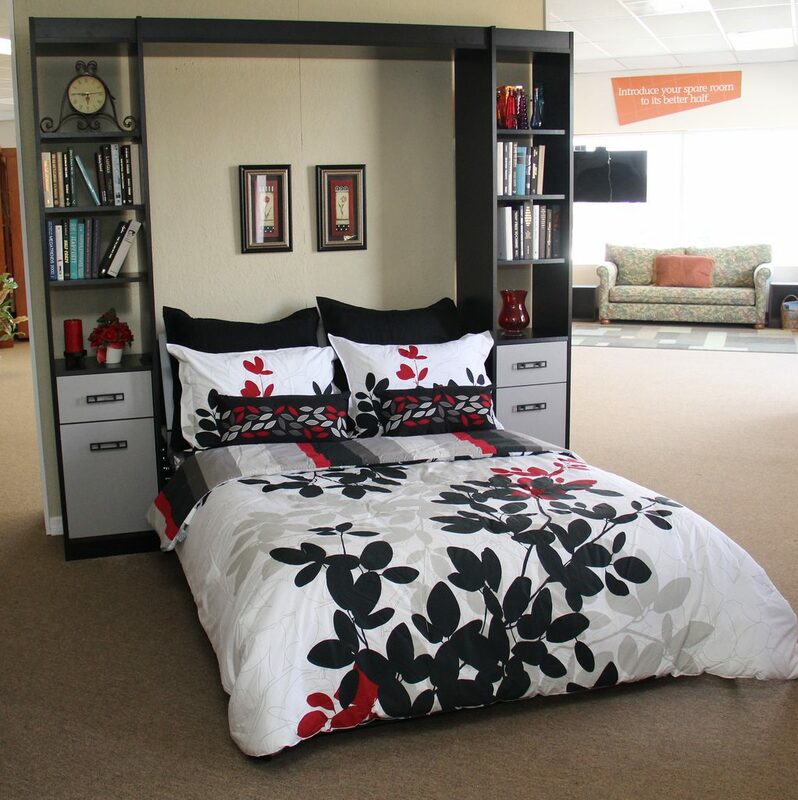 Let’s explore a bit of color coding and home design with murphy bed decor! One of our most important design tips is to use color consciously to create the right tone for your space. Light colors will of course make a room feel brighter, but they also make it feel larger! If you have a small room or want to make your home feel more inviting, opt for light, bright hues. Dark colors, on the other hand, lend a sense of coziness or intimacy. Most rooms will be better off with a mix of both. The contrast between light and dark is pleasant to the eye, so if your murphy bed’s doors and shelves are in contrast to the walls or floor, it will be more visually attractive. Another way to measure color use in your design is by thinking of them in three categories: active, passive, or neutral. Neutral colors are whites, blacks, grays, and browns. These more popular hues can lend a natural feel and complement most aesthetics. Let’s explore a bit about active and passive colors, but know that too much of one category of color can negatively impact a room. Too many active colors, for example, can overstimulate the setting and create visual disarray. Red is an active color often used to evoke passion, orange is right up there with red in terms of intensity, and yellow will quickly grab attention! Colors like these might do well as interior contrast in your murphy bed shelving, with a neutral color like brown or black on the exterior of the shelves. But alone, red and orange may be too stimulating for your murphy bed. Used with discretion, active colors can conjure depth and complex sensations, but overuse can make furniture or entire rooms feel juvenile or overstimulating. Green, blue, and purple are your passive colors. They are especially useful in application to the bed itself. Green is a calming tone, especially in darker shades that evoke a relaxing, natural scene. Blue can give off a sense of coldness, but used correctly, it is a deep and peaceful color. Purple lends the room a sense of luxury, making it an excellent choice for bedding to make a murphy bed appear lavish and inviting! The way you use color in your interior designs can transform your space from mismatched and overstimulating to mature and relaxing. 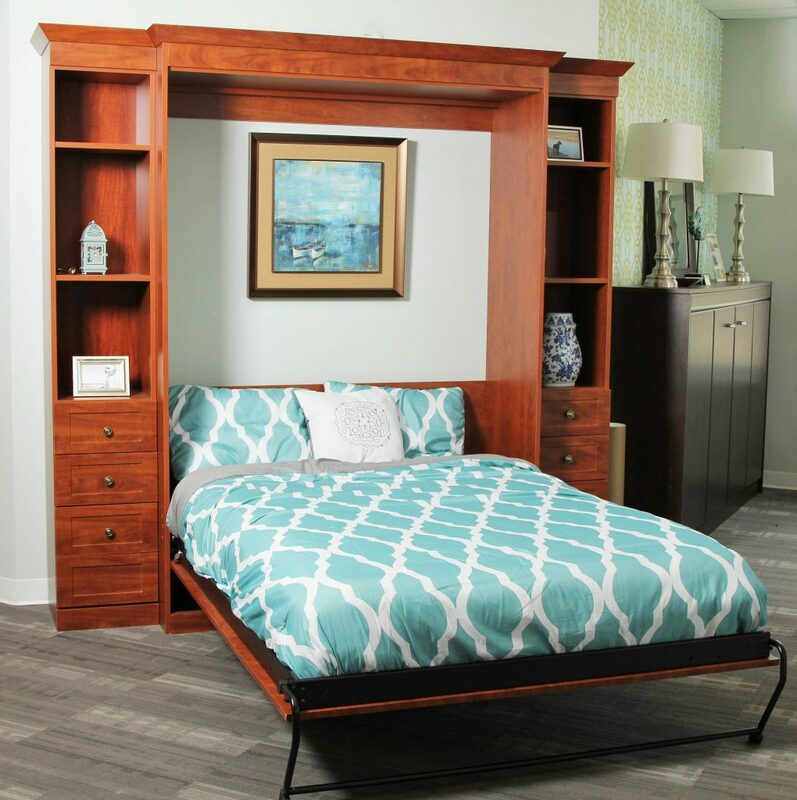 To get started with a custom Murphy bed unit, schedule a free consultation with an expert or visit a showroom near you!